Here we are beginning to assemble information about Generalissimus, Prince of Italy, Count Suvorov-Rimnik. A brief biography. 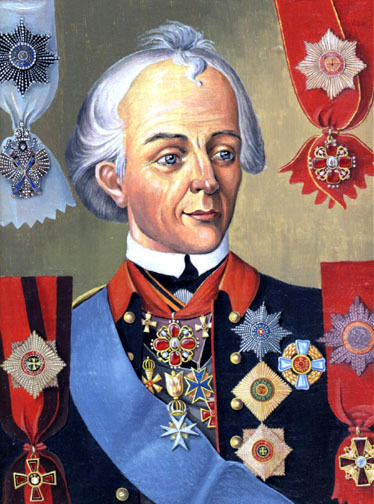 A listing of his major decorations and promotions. Here is the entry on Suvorov from the 11th edition of Encyclopedia Britannica. Map of Kagul Battle, 1 Aug 1770. Philip Longworth - biography of Suvorov - Constable, London, 1965, 350 pgs, index, references, illustrations. This is the best biography of Suvorov in English. Return to the Russian history main page here. Return to the Xenophon main page here.